Be careful not to scratch instrument panel pad and other parts. Disconnect the negative and positive battery terminals, then wait at least three minutes. Refer to PG-50, "Removal and Installation (Battery)". Remove the instrument side finishers (1) (LH/RH) using a suitable tool. Remove the front pillar finishers (LH/RH). Refer to INT-24, "FRONT PILLAR FINISHER : Removal and Installation". Remove the front kicking plates (LH/RH). Refer to INT-24, "KICKING PLATE INNER : Removal and Installation". Remove the audio unit. Refer to AV-58, "Removal and Installation" (BASE AUDIO), AV-122, "Removal and Installation" (DISPLAY AUDIO WITHOUT BOSE) or AV-203, "Removal and Installation" (DISPLAY AUDIO WITH BOSE). Remove the AV control unit. Refer to AV-298, "Removal and Installation" (NAVIGATION WITHOUT BOSE) or AV-406, "Removal and Installation" (NAVIGATION WITH BOSE). Remove the combination switch. Refer to BCS-75, "Removal and Installation". Remove the instrument panel screws (A) (LH/RH). 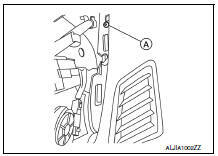 The instrument panel screws (A) can be found near the side defroster grilles (LH/RH). Remove the remaining instrument panel screws. Disconnect the harness connector from the front passenger air bag module. Disconnect all remaining harness connectors. With the help of an assistant, remove the instrument panel assembly. Be careful not to scratch the instrument panel pad and other parts. If replacing the instrument panel, transfer all the necessary parts to the new instrument panel.